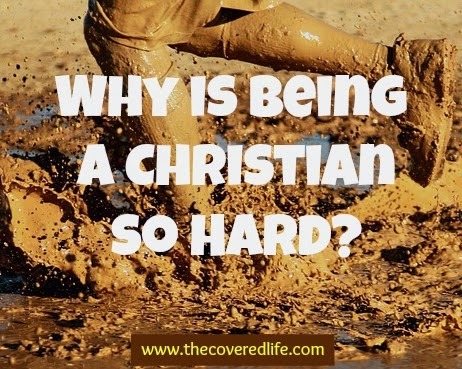 The Covered Life: Why is Being a Christian Hard Sometimes? Why is being a Christian so hard? It didn't seem to be as difficult when I was younger. Shouldn't it be easier to be more Christlike the more mature I become in my faith? When I was little, I seriously thought that the older I got the easier life became... walking is much easier than crawling, and growing taller meant I could reach things with more ease. Obviously this idea of ease with age was thwarted some when Algebra was introduced with end of grade tests and puberty, then college and bills and finally an adult- "Can't nobody tell me what to do anymore!" But as all adults over the age of 22 know, the added responsibilities that you now have, actually keep you more focused and grounded than your 21 year old self thought they would. When we are new believers, likened to babies on milk, we are taking it all in, soaking it up like a sponge. We are hungry and can't get full. And with each new truth we grasp, we grow and progress in our faith journey. As we start getting more into the solid food (deeper truths) of God's word there may be some bumps in the road that are opportunities for our faith to be honed and strengthened. Through them, we start to fully believe that God is who He says He is because He has proven himself faithful. I believe there are some believers who stay in this place for a long time... I know I did. I wanted to learn from others and read devotion books and basically have someone else digest the more difficult concepts of scripture and then spit it out to me in succinct bullet pointed form that I could easily accept without too much digestion on my part. Now, hear me when I say this that I am not opposed to devotion books or teachers or pastors. I think those things are very helpful, and I think teachers and pastors are vital to our knowledge and understanding. But, there comes a time in a believer's life where they have to make a decision. Not the decision of belief- that one's already done if you are Christian. The decision I'm referring to is the one where you decide that you want to really be all that you were created to be. Ephesians 2:10 tells us that we were created with a purpose- a purpose that God has already planned for us: "For we are His creation, created in Christ Jesus for good works, which God prepared ahead of time so that we should walk in them." In actuality, all Christians should continue to mature and live in this purpose. And not to scare you but this is the part where being a Christian becomes the most difficult... but it's also the most amazing (on earth because it gets way better in heaven). But this takes us back to the original question. And in my (completely unauthoritative, I'm a sinner too) humble opinion being a Christian is harder now because we are more aware of our sin. And if we truly want to walk in the purpose God has prepared for us then we don't want that sin to hinder us. I just want to throw a "Booom!" on the end of that- it's like the author is saying being a Christian is hard, don't make it tougher by trying to run it entangled in sin- it needs to be removed first... look to Jesus- at least you aren't having to shed your blood for it like he did! Boom- sin can be defeated and we don't even have to shed our blood for it because boom- Jesus already did that for us! If you really read it, (which I hope you did) then you saw the part that also makes being a Christian seem difficult- God is disciplining us. This is not God smiting us or condemning us for every wrong thing we do- so DO NOT get that picture in your head. God isn't condemning, he's correcting. Because sin leads to death and destruction and God wants more for his children. So let's go back for a minute to the metaphor of the race we are running... to run a race well there is training involved and you need to discipline your body to be able to run the race with perseverance. This training/discipline hurts but it is for the greater purpose of not only running the race but finishing the race strong. If we stay in the place of stagnant faith that I mentioned before then we are barely running the race. 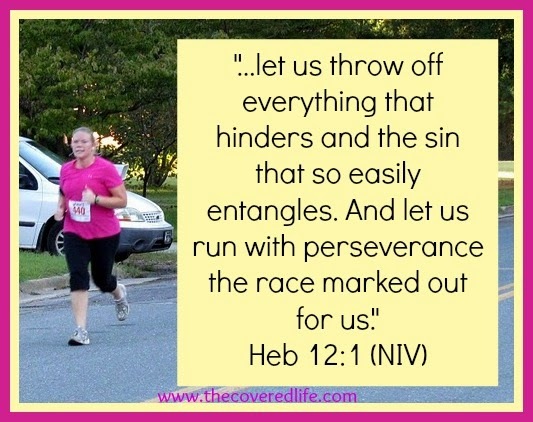 It doesn't mean we sin less or that it isn't still there entangling us- if my shoe strings were tied together, I still may be able to walk, but I wouldn't be able to run with strength and with purpose or with perseverance. So yeah, being a Christian can seem difficult. But we cannot lose sight of the hope we have in Jesus. When we focus on him and the work he accomplished on the cross our hardships pale in comparison and we are reminded that they are light and temporary in light of our full glorious eternity in his presence! So let's run this race with hope and strength and perseverance. Let's face those sins and repent of them so they no longer hinder us. And let's focus on Jesus, the perfect example and the perfecter of our faith.